After 5 months in Texas, we are back on the road. 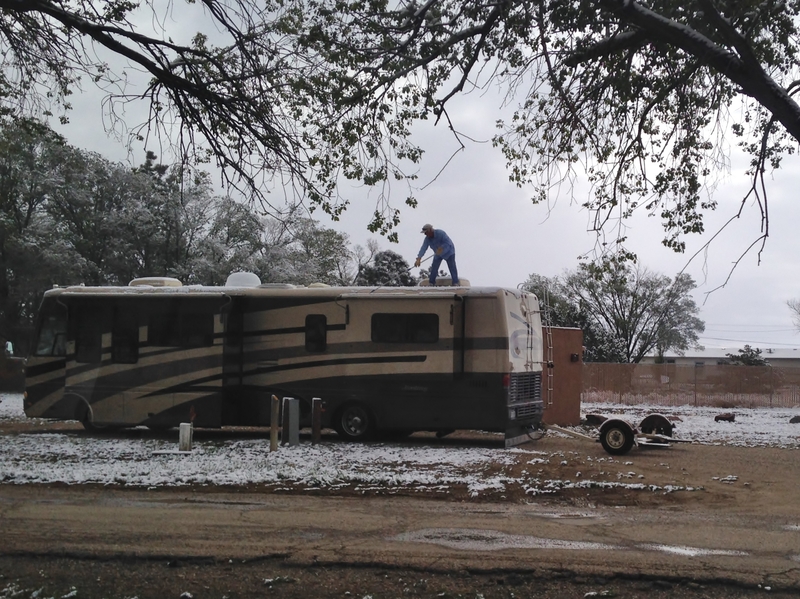 As mentioned previously, we left on April 14th and pointed the Lazy Daze towards New Mexico. 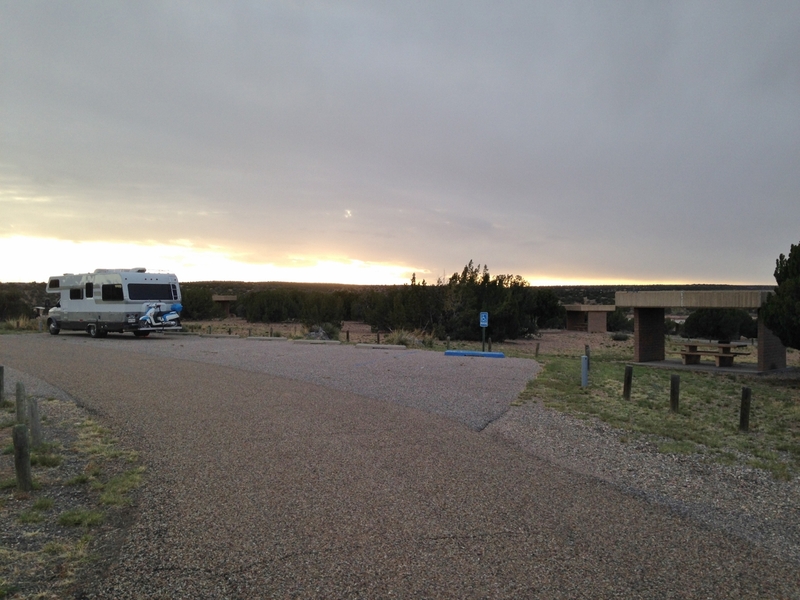 I plan to have a ‘Touring New Mexico State Parks‘ sort of year. Last year was quite expensive, traveling through half of California, visiting San Francisco, then back to New Mexico and Colorado. 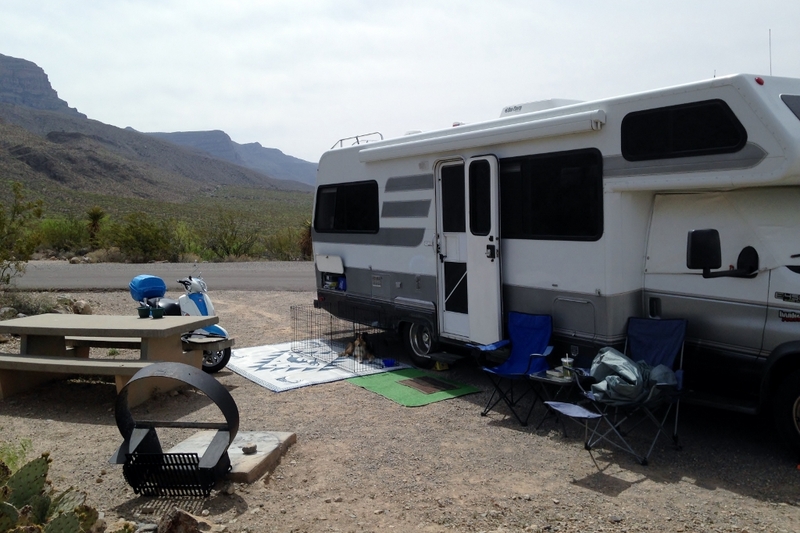 Buying a new RV and scooter was not in my annual budget!! So, I figure maybe when we have a spendy year traveling, then I’ll make the following year a less expensive year. 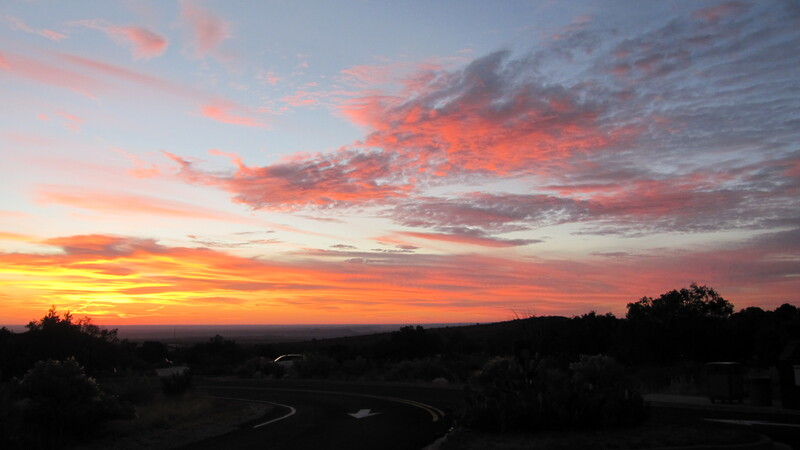 The NM state park system fits that bill. I bought my annual pass ($225) after Balloon Fiesta last October, so we’re good until 10/31/14. 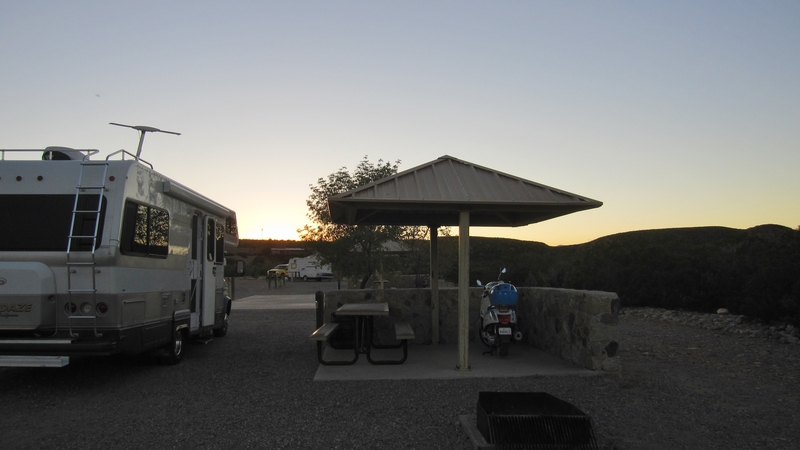 We can park in primitive, developed and water-only sites for free. If we need an electric site it’s just $4 per night. Plus, with all the parks at various elevations across the state, we should be able to adjust to the weather pretty easily. 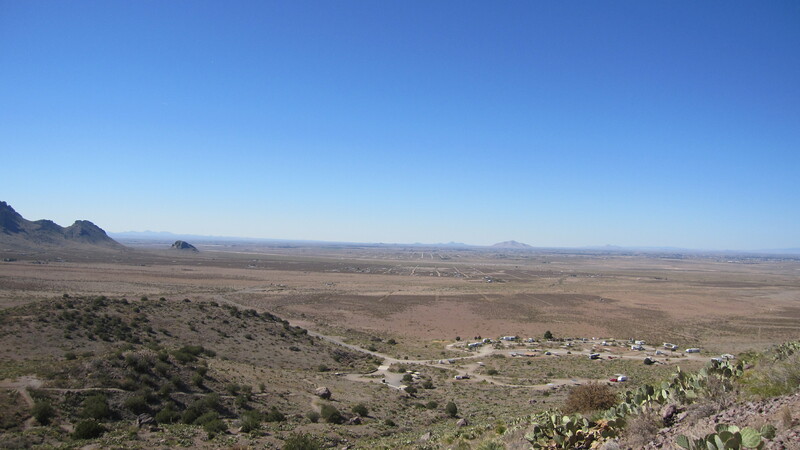 Anyway, we got to Horizon City (just east of El Paso) on the first day. I don’t normally do 515 miles in one day, but I just wasn’t tired of driving until that point. 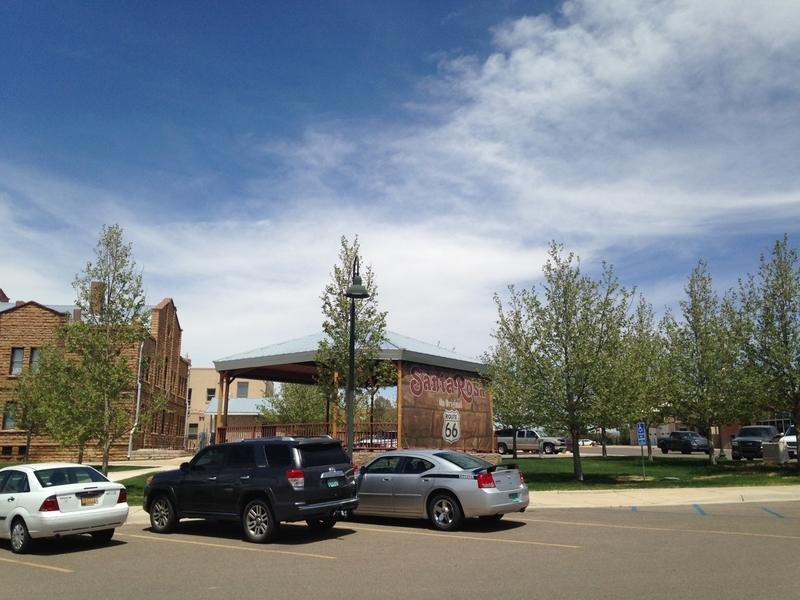 The next day we got to Pancho Villa State Park in Columbus. 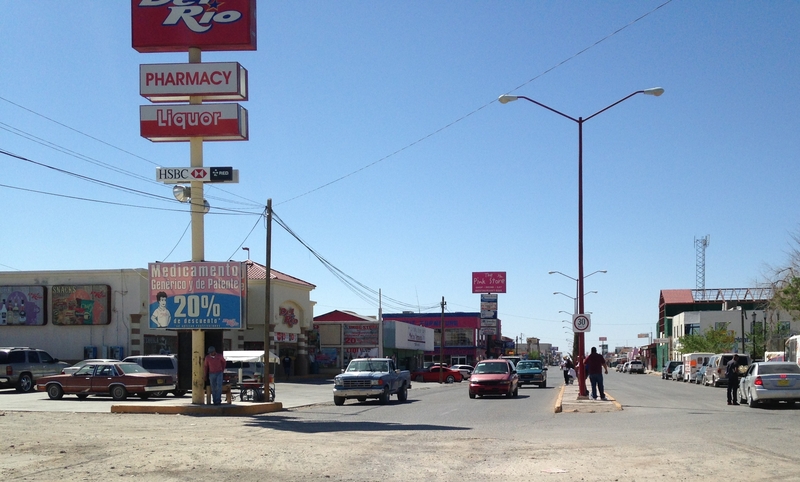 Columbus isn’t much of a town, but it’s just 3 miles north of Las Palomas, Mexico, and I needed a dental checkup. 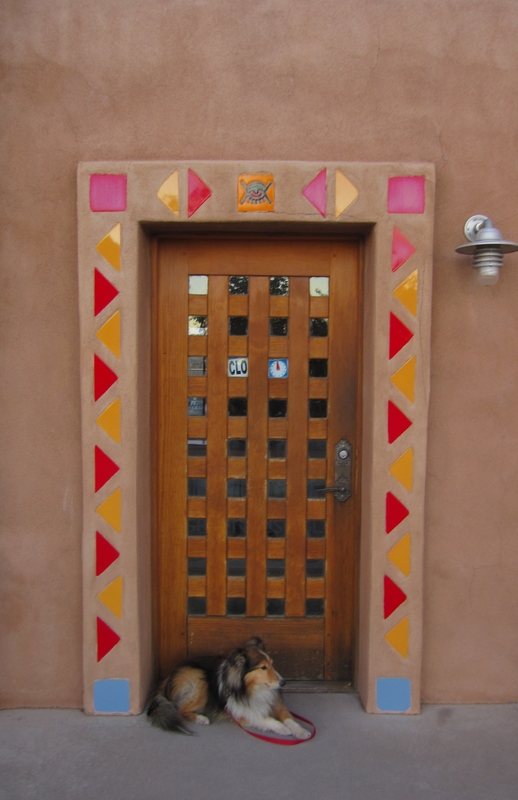 I had looked at other Lazy Daze owners blogs (Jim/Gayle and Andy Baird) about Las Palomas, as I remembered reading they had been there for dental or vision care. I have a good Obamacare plan now, but no dental. It would cost $150 to have my previous dentist do a checkup and cleaning, so made an appointment at American Dental in Las Palomas for the morning of the 17th. The place was a perfectly normal dental office, instruments came out of a sterilized sealed packet, nice competent doctor, no problem. 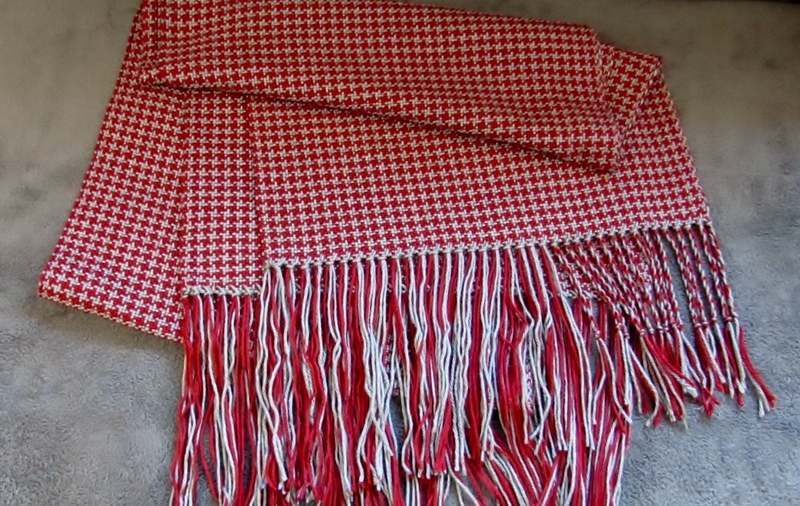 Cost was $35 cash, no additional work needed – Yay! Next, we headed up to Rockhound State Park. We had liked it there previously. This time there was only one site available and it was hard to get level there. Plus the flies were horrid! 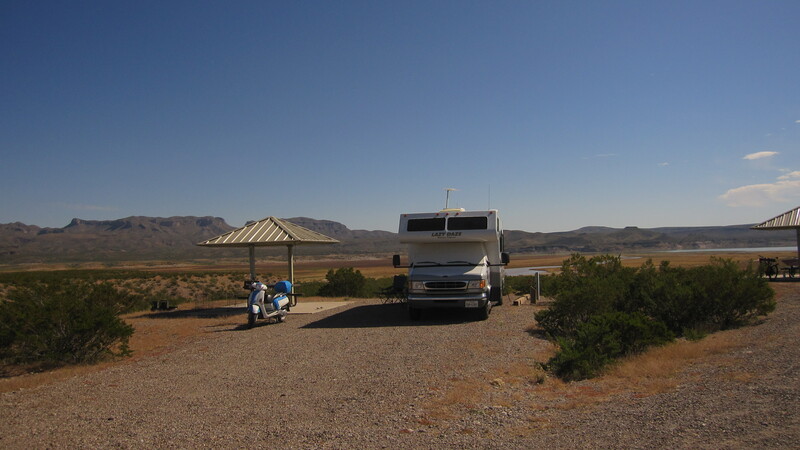 So, I decided to not stay and just go straight to our next planned stop – Oliver Lee Memorial State Park near Alamogordo. We hadn’t been there before, so wanted to work it into this trip. I really liked it! Good hiking, close to a decent sized town, good space between the sites, and I was able to get a pretty level no-hookup site away from the electric/reservation section. The next day I got our site all set up. I don’t normally put a lot of stuff outside, but if I plan to stay in a site for several days, or 2 weeks like here, I get the big rug out and Riley’s ex-pen. He loves to hang out outside with me. We hiked the Riparian Trail, a short nature trail from the visitor center along a creek. 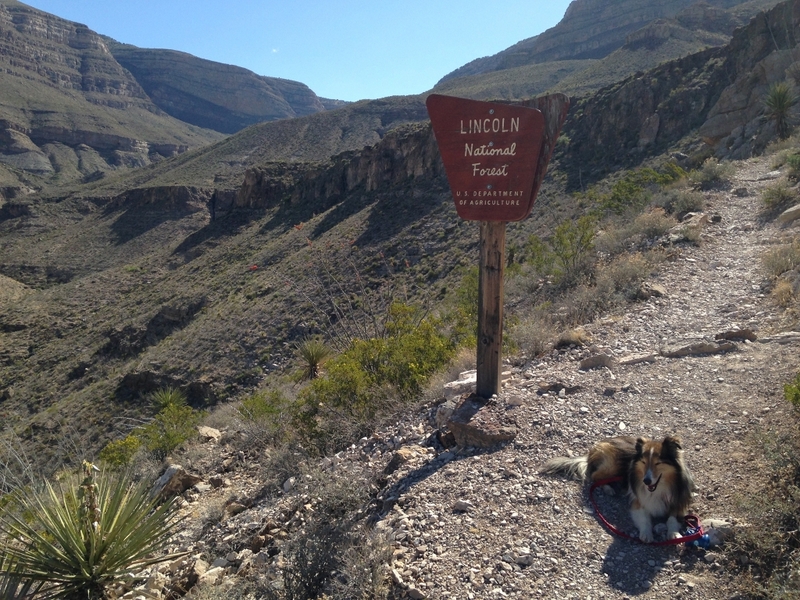 Then we hiked the Dog Canyon Trail. That is actually a long, several mile, all-day hike, with major elevation gain up into the forest. We did part of it, 1 mile or so then back. That’s all Riley could handle. On another day we did 2 miles, then back. He really does not like the rocky trails and can only go for a few miles, then wants to lay down a lot. We need to build back up to longer hikes like we did last year. 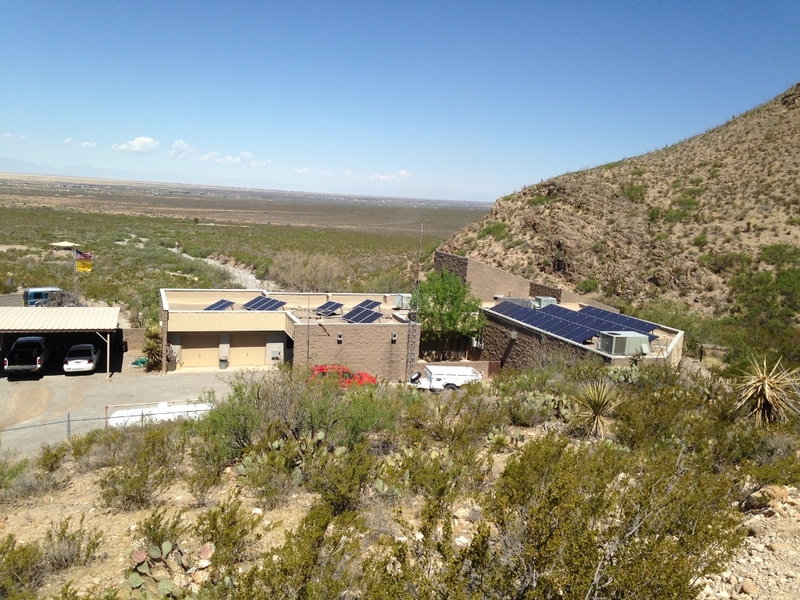 On the way back down I noticed all the solar on the visitor center. I really like to see the alternative energy efforts of the state parks. When we got back to the RV Riley was tuckered out. Didn’t quite make his bed, and did not care. 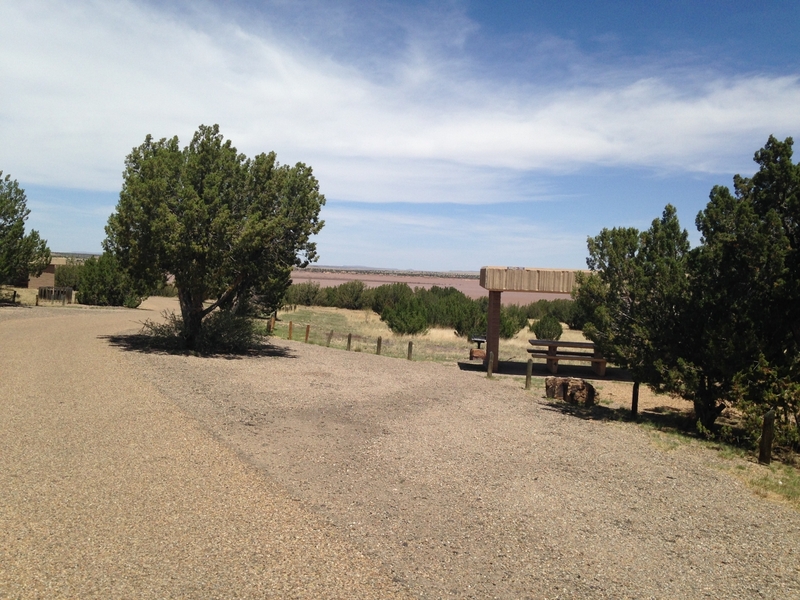 So, Oliver Lee is definitely one park I will keep on my list of go-to NM state parks. 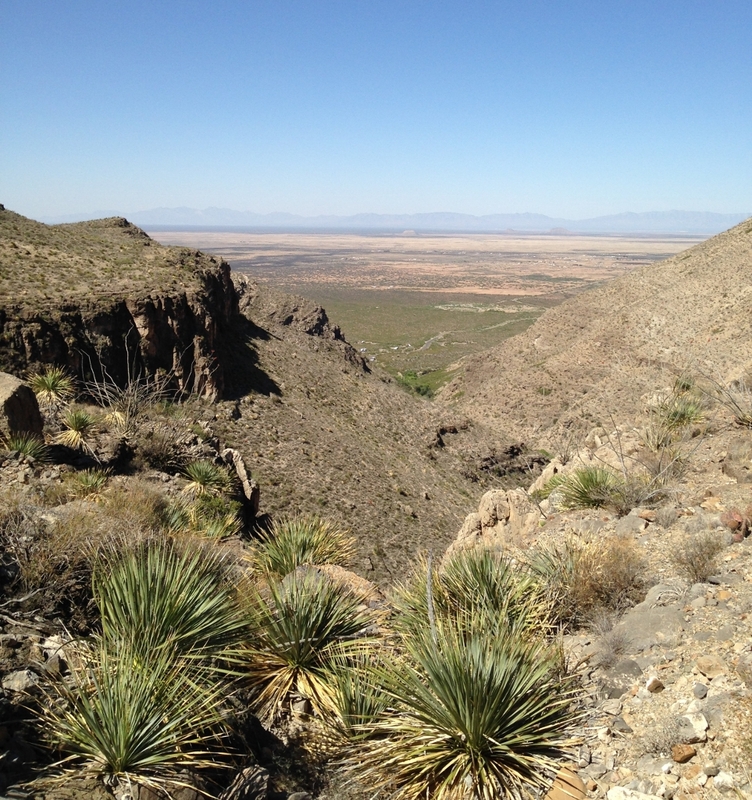 It’s pretty close to Alamogordo with decent shopping – Walmart, Lowe’s, Home Depot, Lowes (the food one), good hiking, good Verizon signal and TV, and a good breeze (high enough up above the town). It’s a short ride to town on Hwy 54, but that is too major of a road (65 mph) for me and the scooter, so I found a back way in on lesser roads that I could go 45 mph or less. After about 2 weeks we headed to Santa Rosa Lake State Park. Will post about that next. Currently I’m at Storrie Lake State Park, with plans to visit Coyote Creek, Eagle Nest Lake, Cimmaron Canyon, and Hyde Memorial this summer. 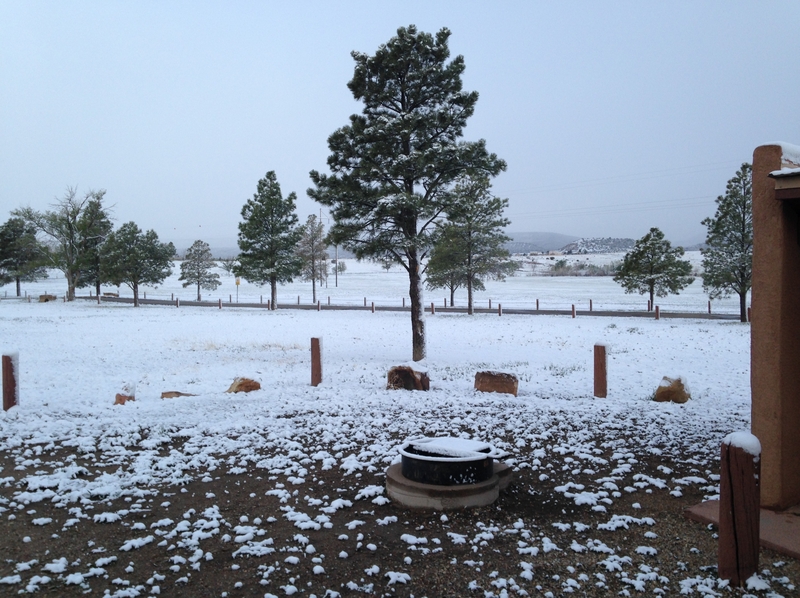 Hyde Memorial State Park is near Santa Fe. Chris and I spent a couple of weeks there last June. 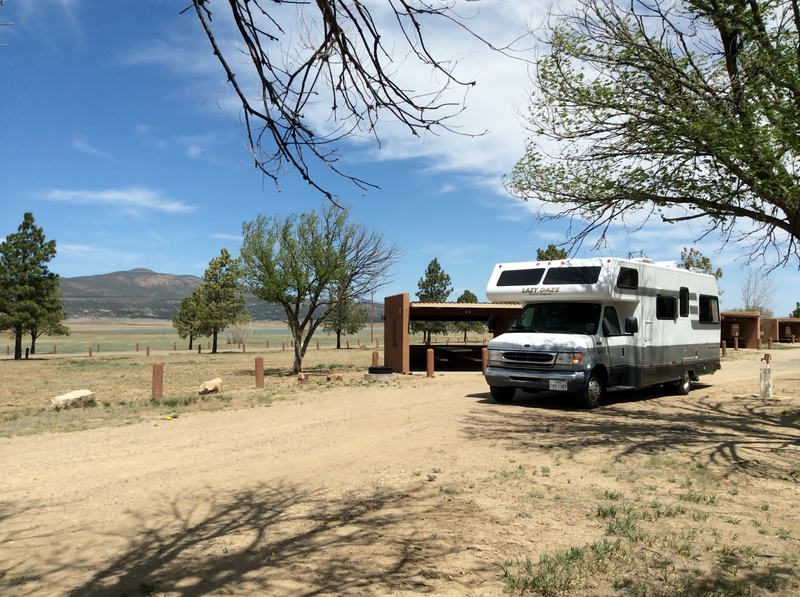 Having a free spot to stay just a few miles from Santa Fe is great. Unfortunately, there isn’t any Verizon signal at the campground. Will have to go in to town for internet. But I have the scooter now, so no problem! 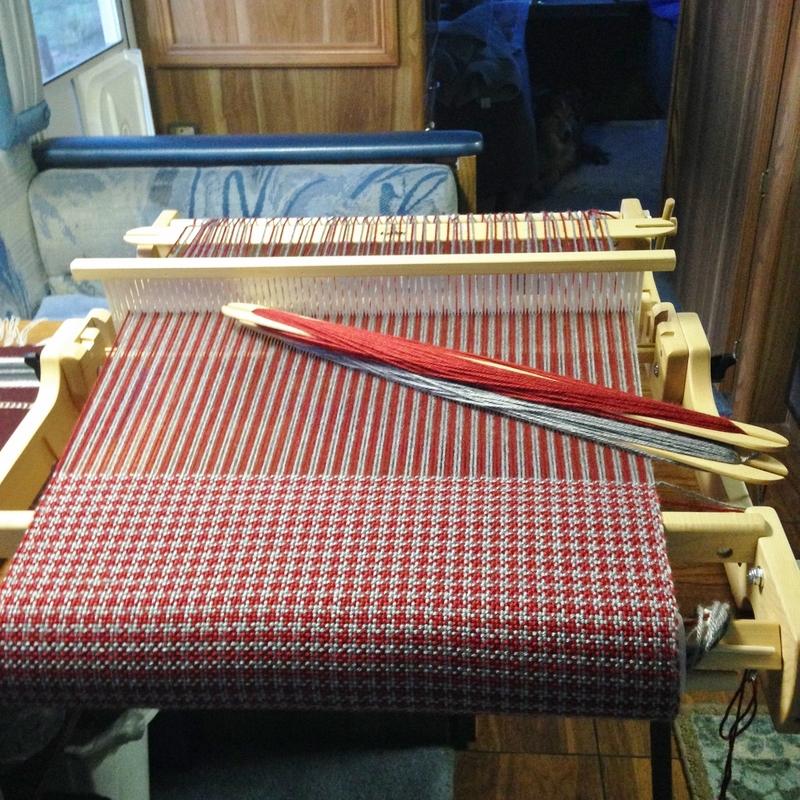 More soon…. 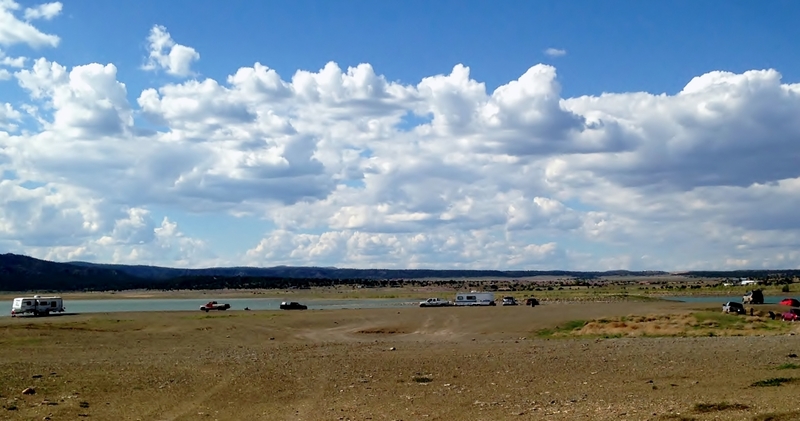 From Albuquerque we headed south on I-25 to Truth or Consequences and Elephant Butte Lake State Park. I didn’t get to leave until mid-afternoon, after finishing my realignment job at Statkus Engine. 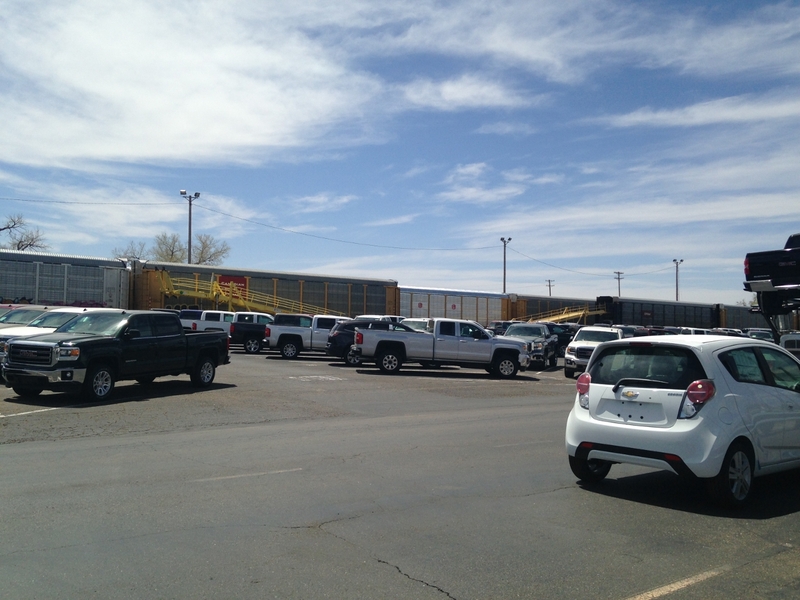 It’s a good 150 miles to Elephant Butte, and I was stopping in Socorro to do laundry. We got to T or C just after dark, so I just popped in to the Walmart right off I-25 and parked for the night. 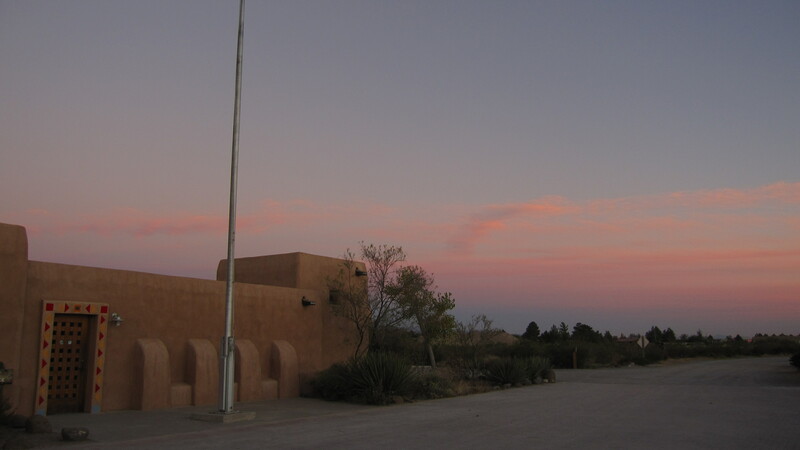 My New Mexico State Parks annual pass had expired and I needed to buy a new one, which I could do at the park entrance in the morning. It’s really the best deal in the country. 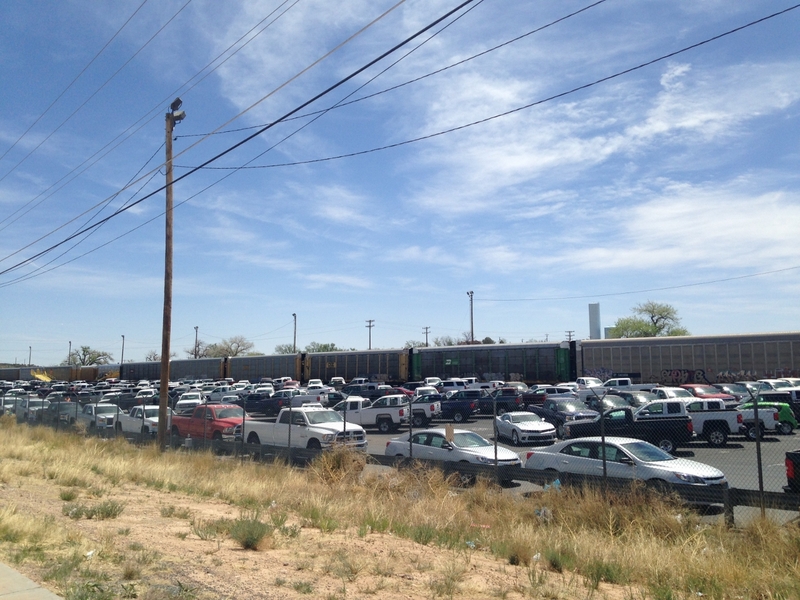 Out-of-state residents pay $225 for the pass (NM residents pay even less), which cuts $10 off of the nightly the rate. Developed sites are $10, so they become free; electric sites, normally $14, are $4 with the pass. Can’t beat it with a stick! It would pay for itself before I left the state, and I knew we would be traveling to NM again in 2014. 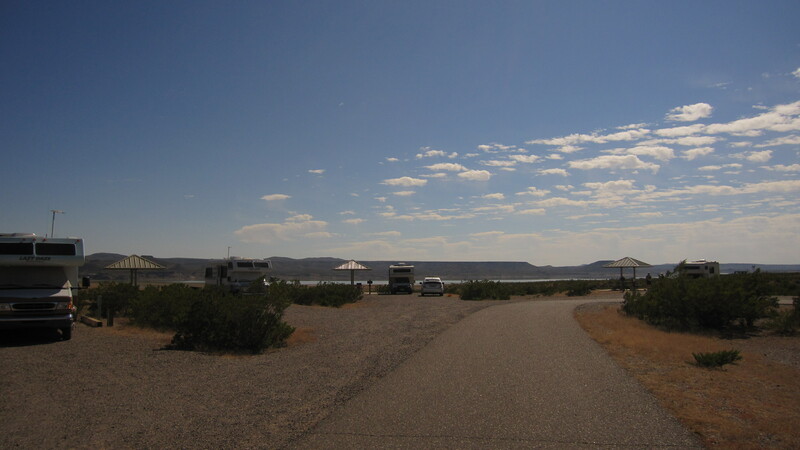 Anyway, I wanted to get to Elephant Butte as soon as possible. Christine and Carol were there and our friend Roxanne was there, but planned to leave within a day or so. 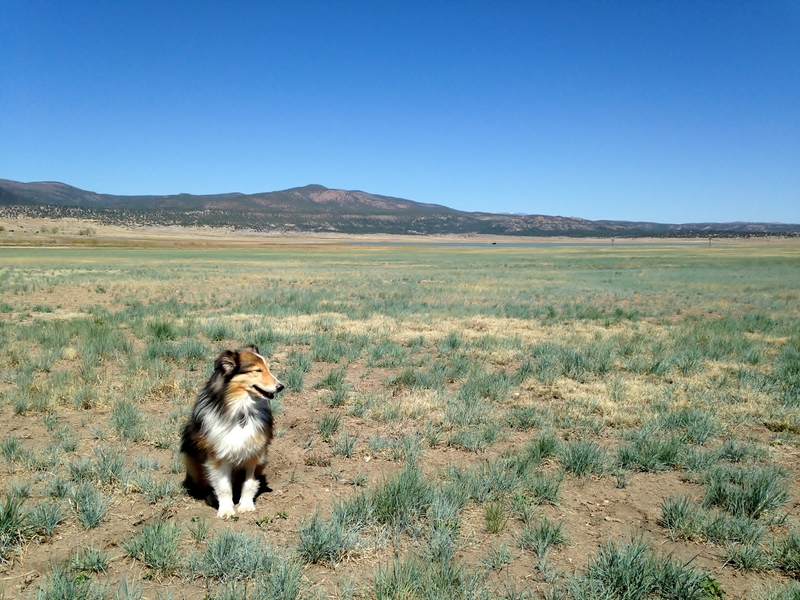 I had last camped with Roxi in the Coconino NF near Flagstaff, when she and Annie were there in the Duck and hadn’t seen her for a year. 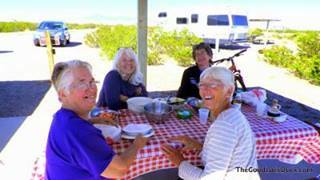 So we headed over to the main part of the park and met up with the gals at the Desert Cove Campground. 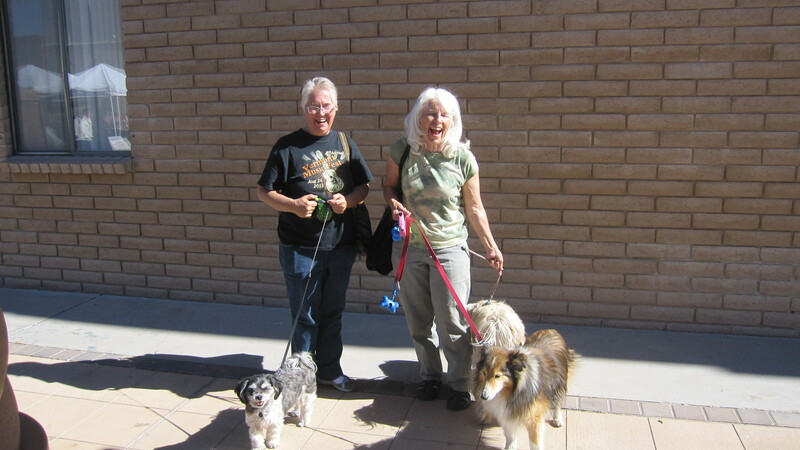 The next day, Saturday, Christine drove us to Truth or Consequences to the farmer’s market. 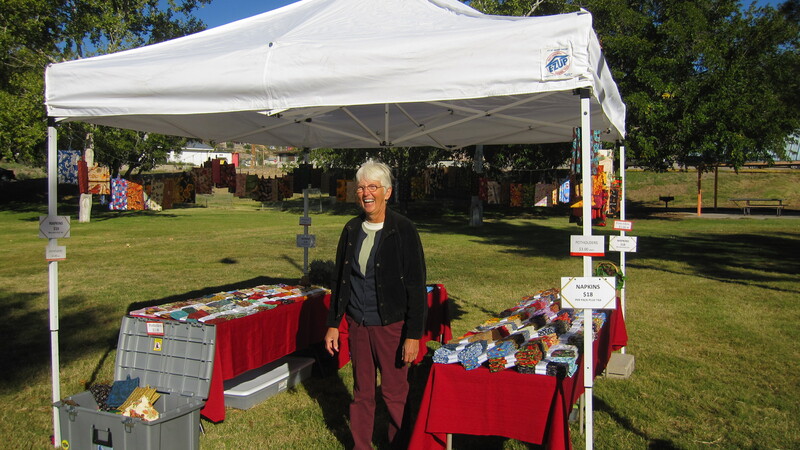 Carol had a booth set up to sell the napkin sets and potholders that she makes. 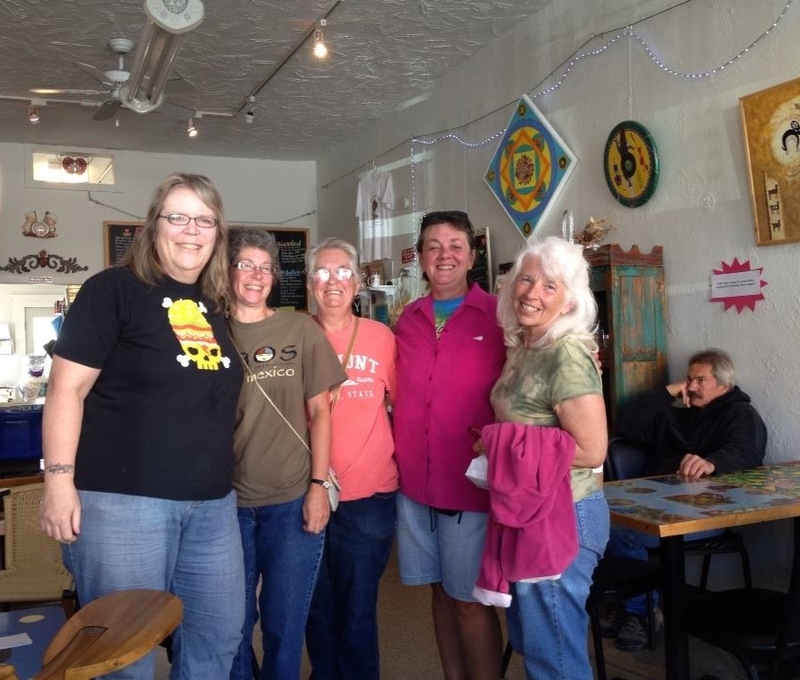 Afterwards we met at the Passion Pie Cafe for breakfast with Roxi and Sue. Sue is in the Women Go Solo Yahoo group that we are all on, but I hadn’t met her yet. Great coffee, great breakfast, and great gabbing. Always fun to hang with the gal pals. Just a few yards over from the Passion Pie stood this piece of street art. Truth or Consequences is a funky town. Anyway, around this time I was having trouble with my TV reception. It had worked fine in Albuquerque. But the TV towers for all of central NM are on Sandia Peak, right above the casino. Getting reception there is easy. Chris brought the TV from his RV over to see if it was a TV thing, but no, didn’t work. Next, I took a long cable wire and ran it directly off the top of my antenna, in through the window, and to the TV. That worked. So, it was a wire problem. Turns out the connection going into the RV at the base of the antenna was fried. I guess I had been picking up channels from the TV itself, without the roof antenna. I hopped on the scooter and cruised into T or C, got new connections and tools and replaced the fried pieces. Easy-peasy. Saturday we all (Andy, Roxanne and I) piled into Christine’s RV and headed to town for the farmer’s market and then met Sue at the Passion Pie Cafe again. Chris stayed a couple extra days at South Monticello. 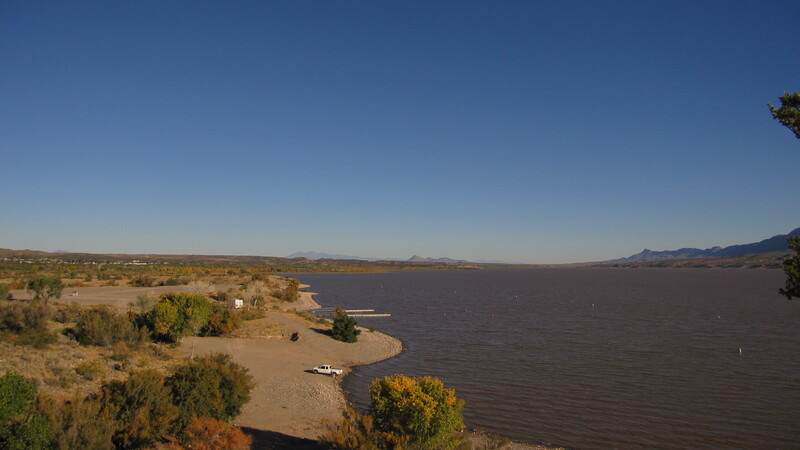 He had just bought a new kayak in Elephant Butte and wanted to spend time on the lake fishing with it. Christine and Andy would follow in a few days. Roxi was heading northwest to her property. She had just bought a parcel of land with an unfinished cabin on it. She’d been planning to visit it and start making plans, but had stayed several extra days in the T or C area with us. I was glad to be able to spend some time hanging out with her. Last year I spent time with my buds at the Riverside campground below the dam, so this time I wanted to spend time up at the main campground. 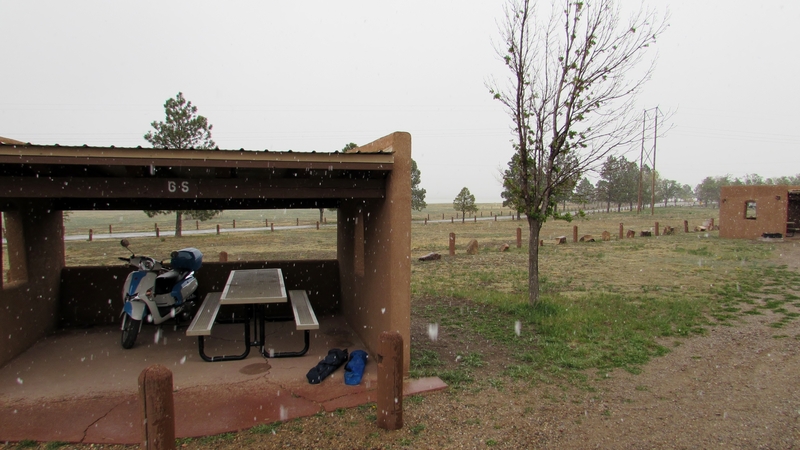 The Caballo sites are OK, but they have a very nice enclosure for the picnic table, with a carport! Caballo site with a parking spot for my scooter! There is really nothing near Caballo. 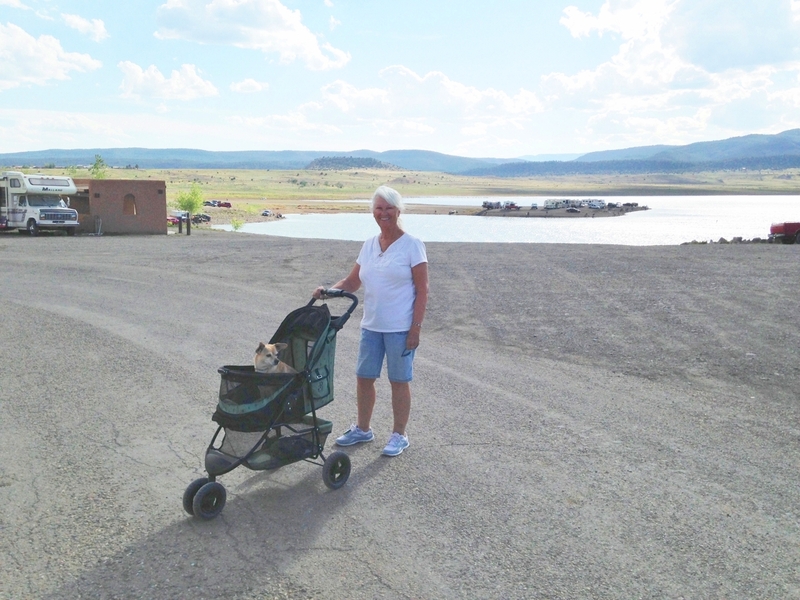 I was having a new iPad delivered to the park, then planned to move along to Leasburg Dam State Park, just north of Las Cruces. Christine and Andy had spend a few days at Caballo, but had moved on to Deming and we planned to meet up again at Leasburg. Chris was going to head back north on the way to Phoenix for Thanksgiving. Before leaving, Chris and I worked on practicing loading and unloading my scooter. He spotted me while I worked the scooter several times, eventually I got better at it. 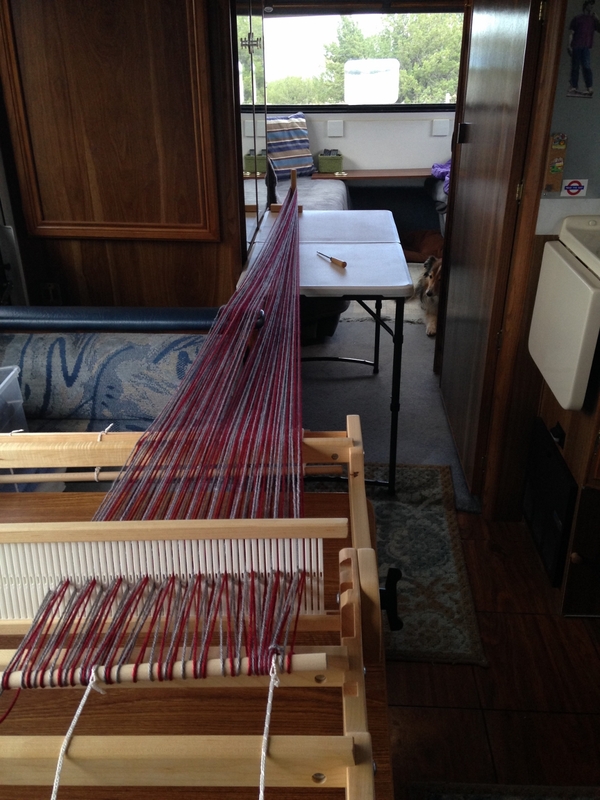 Now I can load it as well as unload it by myself (as long as I’m on flat ground). I really wanted to be able to put it on and off by myself. I came close to dropping it at Sandia when loading it by myself and sometimes it scares me. So practicing with Chris was important for me. Which is more handsome? Riley or the door? 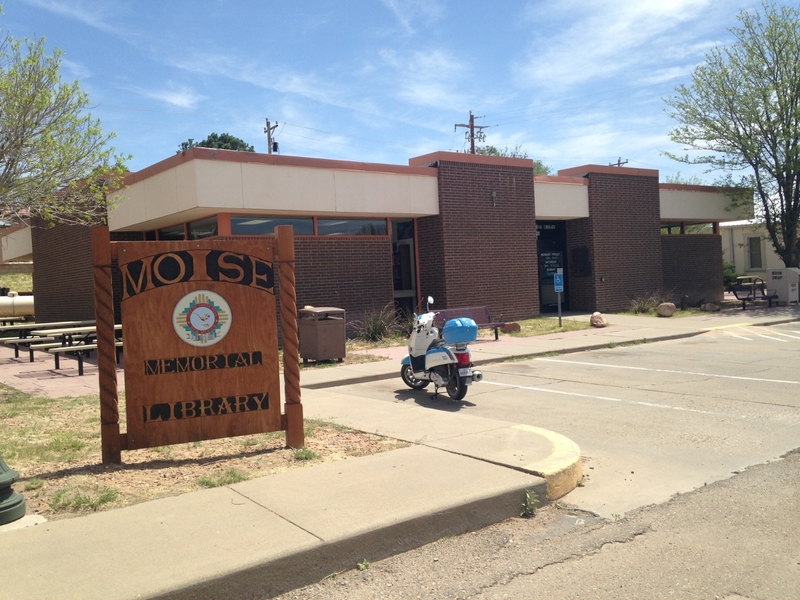 I scooted in to Las Cruces on Wednesday for the mid-week farmer’s market. It’s good – a couple of blocks downtown, a mix of food and crafts. On Saturday Christine, Andy and I went downtown to the farmer’s market, which is just huge on Saturdays. Then it’s about 8 blocks long, plenty of food, and a LOT of arts and crafts. After the market we went to the theater to see “Gravity” in 3D. Great movie, especially in 3D. 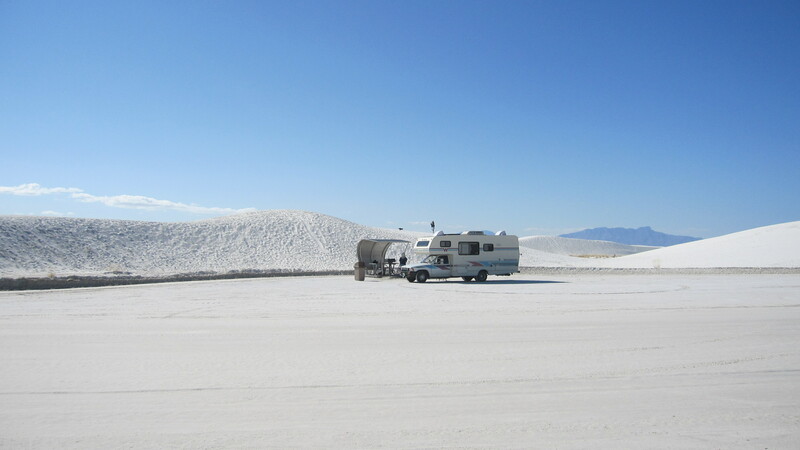 White Sands National Monument is not far from Las Cruces, so on Tuesday 11/12 we packed our lunches, piled in Christine’s Toyota, and headed over. 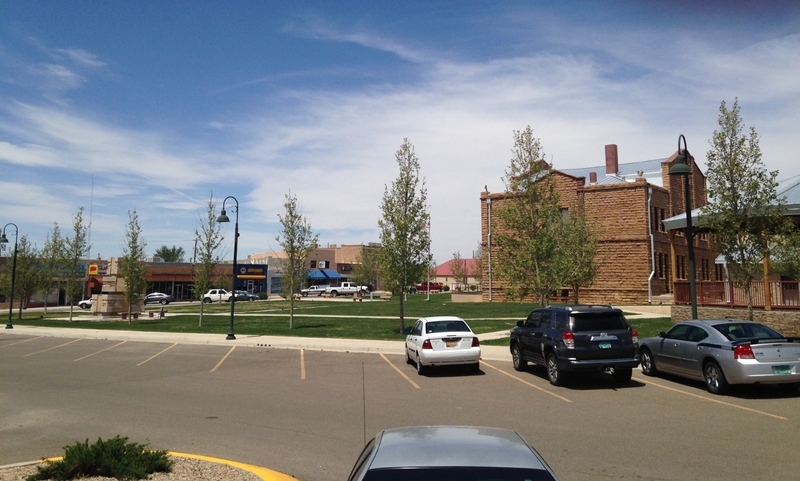 The visitor center is right at the entrance, so we checked that out. We each wanted a t-shirt, and when we decided to buy the same shirt, we had to dork it up and put them on for a picture. Here is where we stopped for lunch. It was nice to have one more outing with the girls before leaving. When we got back to the park I got busy packing up, since we were heading back to Texas in the morning. I was able to load the scooter by myself, no one else was around. Yay! The next morning I dumped the tanks on the way out and headed south to pick up I-10 to cross west Texas. 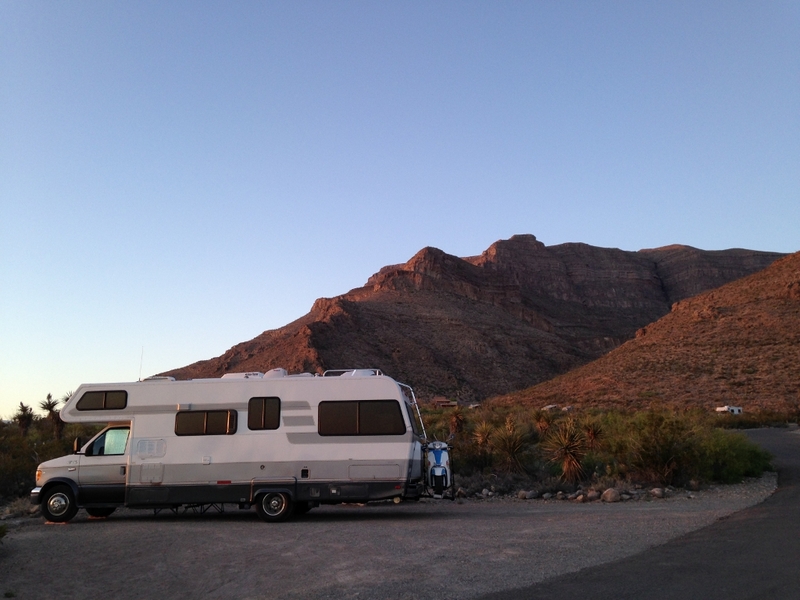 We made it to Fort Stockton by late afternoon, so just pulled into a corner of the Walmart parking lot for the night. Close to the highway, but quiet. That’s a good overnight spot! 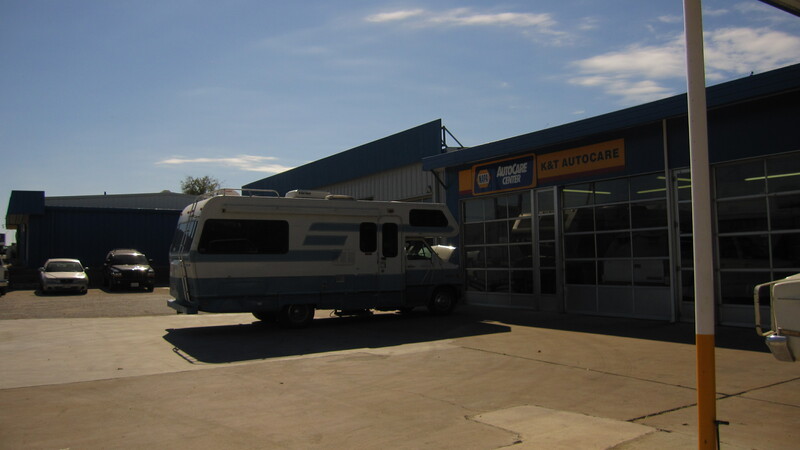 The 2-day trip was pretty uneventful and I stopped near the end for an oil change and inspection. Back in Denver in July, when I registered my new rig, I found out it would have to be inspected within 3 days of entering Texas. So got it done and out of the way. All told, I was on the road for just over 10 months and 6,800 miles. I can’t even count all the new friends I made. What a great trip! 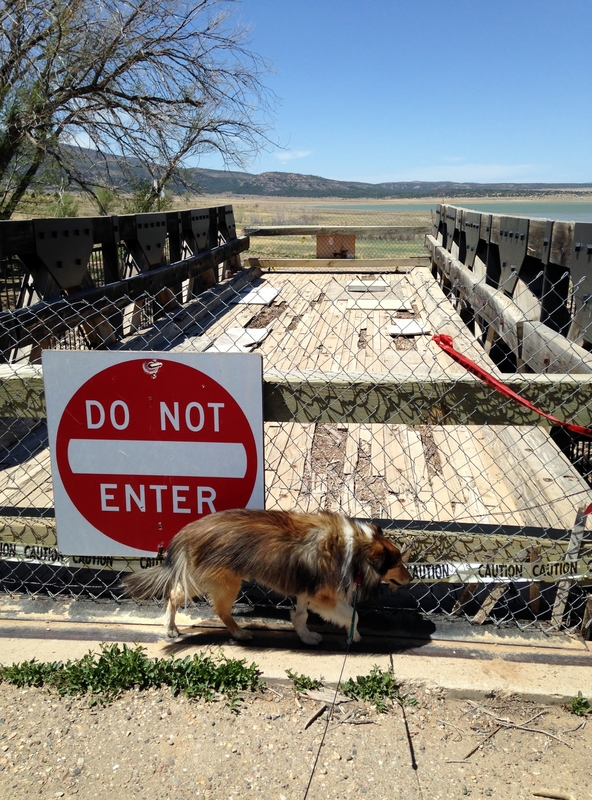 Riley and I left City of Rocks State Park on Nov. 1st and headed to Rockhound State Park, outside of Deming. It’s set among the Florida Mountains, and there are some really interesting rocks to be found. There are areas of ash and lava deposits where people have found geodes and ‘thundereggs’, which are like geodes, but with a solid center. You can take up to 15 pounds of rocks per person. There are also quartz, jasper and other common, but pretty rocks. We got settled into a site at the top of the hill, right under the mountain. The TV towers of the local channels are all there, the highest point in the area. So I got GREAT reception on my little rabbit-ear type antenna. On Saturday I got to watch UT play (and win) against Texas Tech. On Sunday was a full NFL day! 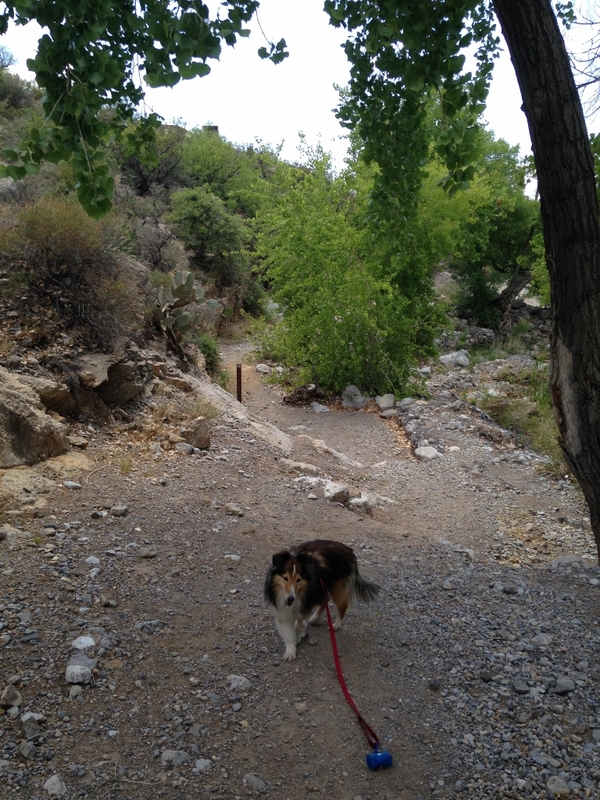 Riley and I also hiked the trail that runs above the campground, partway up the mountain. 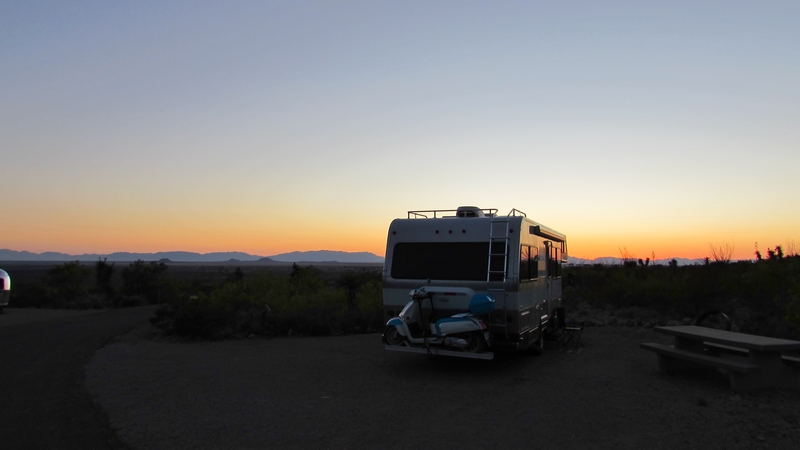 On Monday, I did some rockhounding, leaving Riley in the RV and climbing most of the way up the mountain to see if I could find any thundereggs or geodes. I think I found a couple of small ones, but haven’t broken them open yet. I really liked Rockhound. Being so high up it gets a good breeze during the day and the views/sunsets are great. But, I had more I wanted to see before getting back to TX by Thanksgiving. So we were off on Tuesday, the 6th. 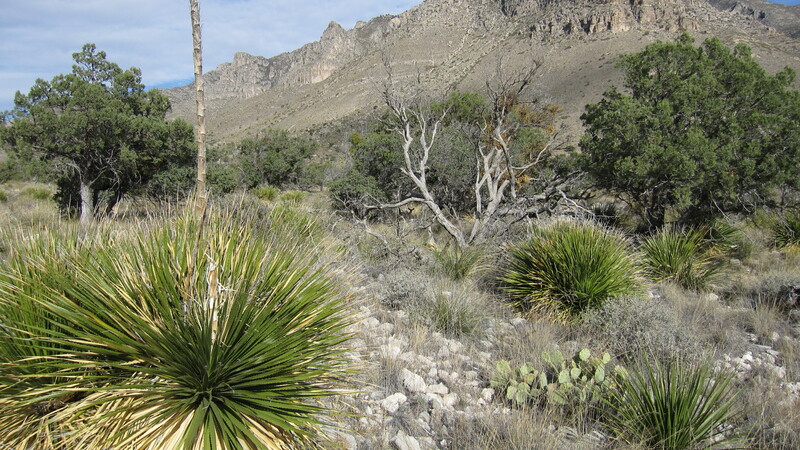 I was heading next to Guadalupe Mountains National Park, but stopped in Las Cruces for an overnight. I wanted to watch the election results and do laundry. Stayed at Sunny Acres RV Park, which is an Escapees affiliated park with a 50% discount (usually the Escapee parks have 15% discounts). It was a good park with a clean laundry room. 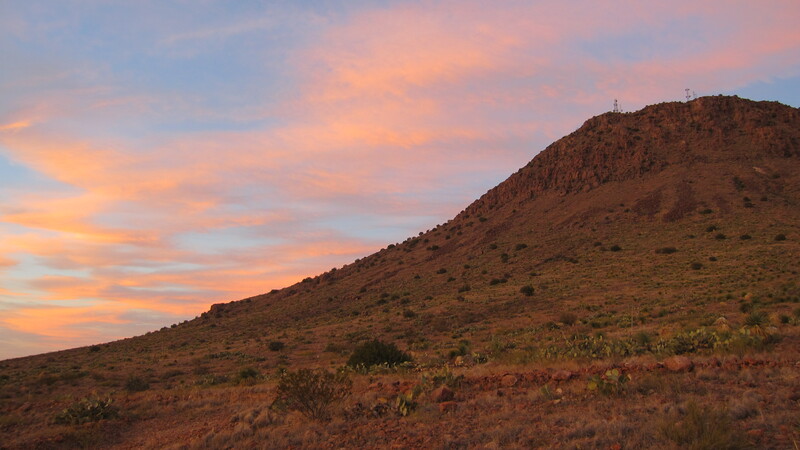 The next morning I hit the Las Cruces Farmer’s Market, Tandy in El Paso for bookbinding leather, and got to Guadalupe Mountain just before dark. The campground is just a parking lot with site numbers marked, but at least it was right in the park. Riley and I hiked the one trail that allows dogs. Along the hiking trail. Can you see the deer in the brush? Almost dead center of the picture. 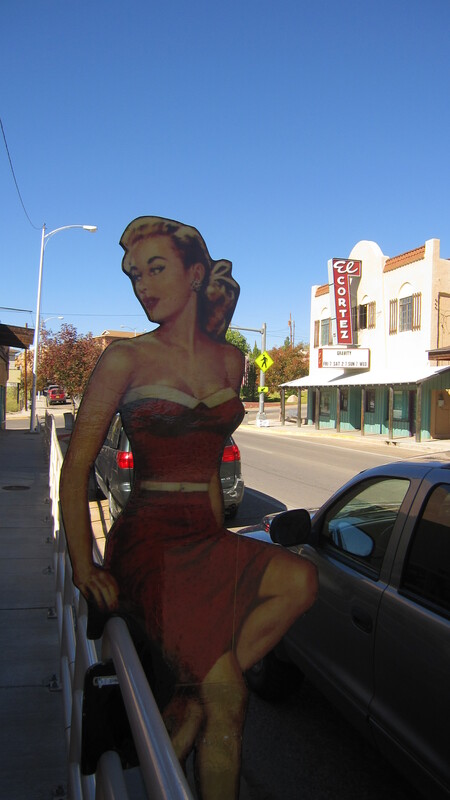 The next day we went to Carlsbad, NM. I thought about going to the caverns. I had been there as a kid, but supposedly they have made some upgrades to the lighting and may be worth going again. 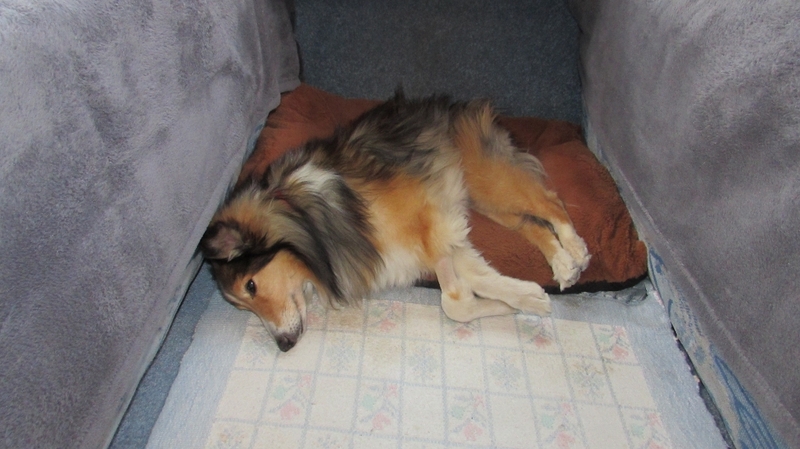 It was too hot to leave Riley in the RV and I didn’t want to kennel him, so passed. Besides, the bats had all gone to Mexico for the winter, so no evening flight program. I stopped at the Walmart and then went a few miles up the road to Brantley Lake State Park. 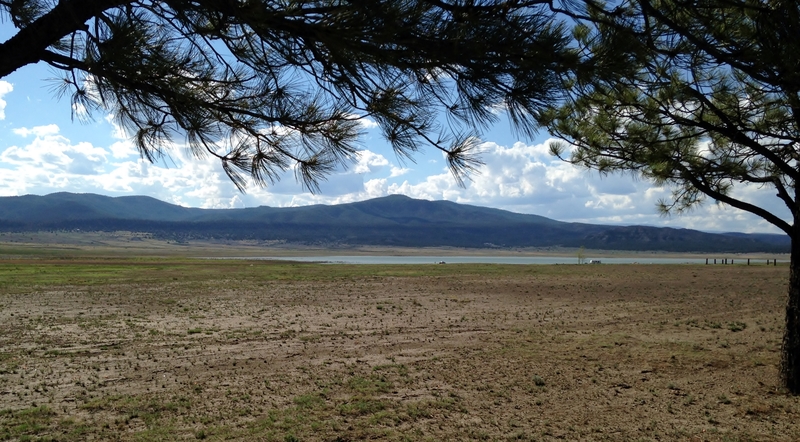 The lake is really low, like pretty much all the lakes at the parks we visited. It was a decent park. I bet it would be great when the lake is up closer to the sites. It had no Verizon coverage and no park wi-fi. That’s OK for a day or two, but by the third day I was ready to seek greener pastures. 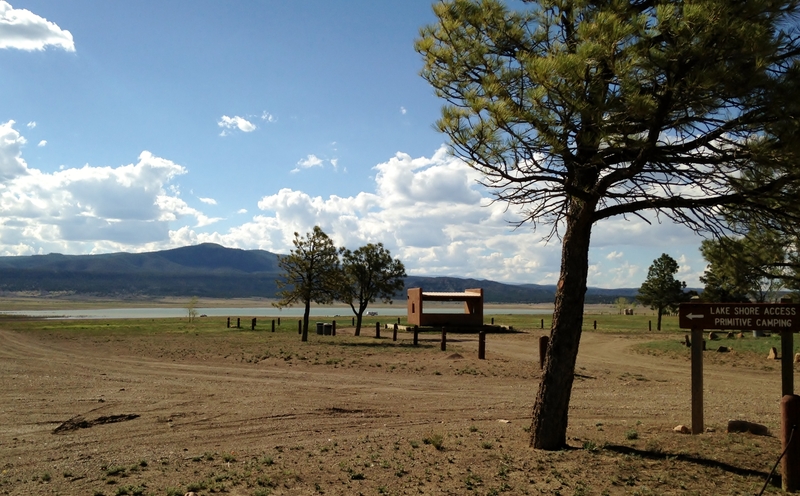 Chris had moved to Bottomless Lakes State Park near Roswell, which had no Verizon, but did have wi-fi in the park. It wasn’t far, so I decided to check out that park. 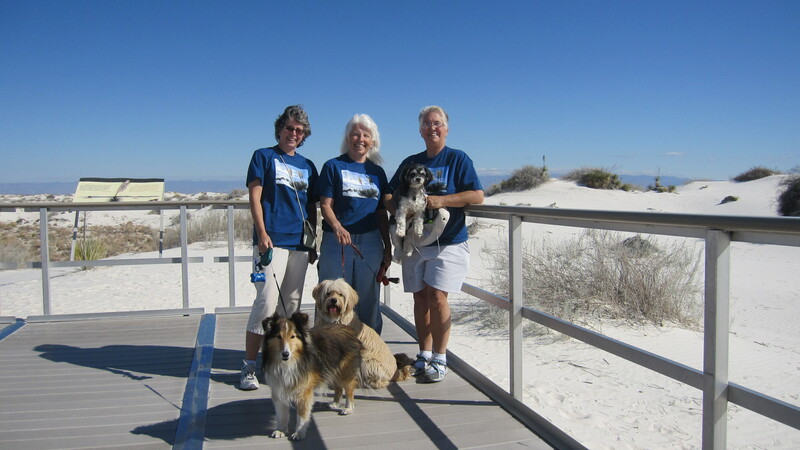 The lakes are a series of sinkholes, and the campground is by a nice, big lake with a beach. I found a site in the area with electric/water hookups, but there are nice no-hookup sites across the lake that are along the water’s edge. 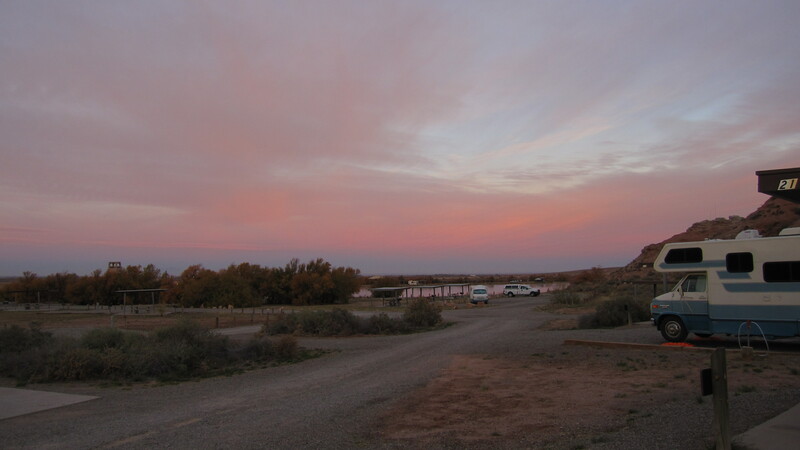 Generally the best sites at the NM parks have no hookups. Chris was in an area nearby with no hookups (where the 2 trucks are in the picture above), but it was about to get super cold so she moved to a electric site further up the hill to be able to run her electric heater. I moved from a site further over to the one above, where I could have a view of the lake and was closer to the wi-fi antenna. Again, we hiked, walked dogs together, and I picked her brain about full-timing in an RV. On Friday the 16th, I left to head back to my folks place northwest of Austin for the holidays. We made it to San Angelo that night and just stayed at the Walmart. On Saturday I planned to get in by about noon. We stopped in Brady for a break and dog walk, but when I tried to start the engine up it was dead. Oh, no. Luckily I had signed up for Coachnet service and they got a local auto repair shop over to me right away. Keith from K&T Automotive got me charged up enough to follow him to his shop down the road. While there he diagnosed that a wire from the alternator to the battery had blown and I wasn’t getting a charge. He fixed me up and for $70 I was on my way. 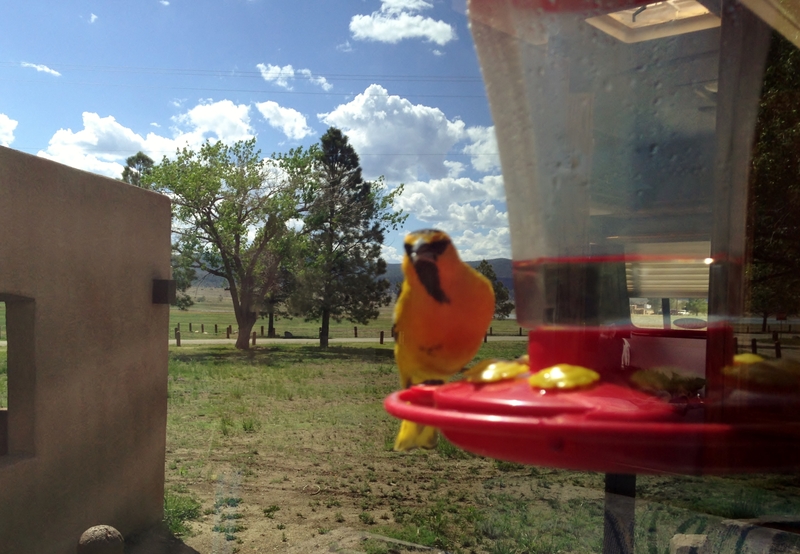 Funny – I did about 6,000 miles on the trip, but couldn’t make it the final 70! Oh well, at least it was easily and quickly fixable. I think I made it home by 3:00 or so. It was a great trip. 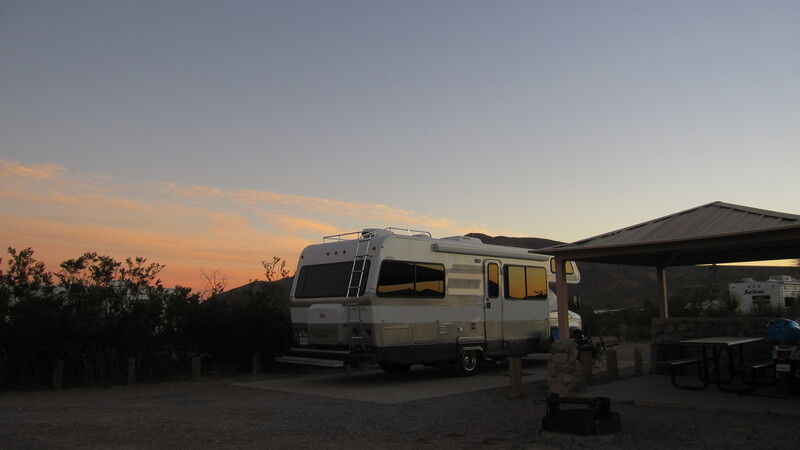 So great that I decided to do another trip for 2013, starting in Quartzsite in January. Then, when the weather warms will go into California where I will (hopefully) visit Yosemite, Sequoias, and the Redwoods. Also, will visit the Oregon coast and Crater Lake, Washington state, Seattle and Vancouver, and Glacier National Park. Over the holidays I had a lot of stuff to do. I will do one post about all that, then start up writing about the new trip. Thanks to everyone that have been reading my travel log. I hope you enjoyed the pictures, and got a tip or two of places to go on your own travels.